This post is the second part of Katello series. 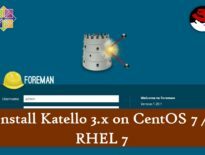 In our previous article, we covered the Installation of Katello on CentOS 7 / RHEL 7. 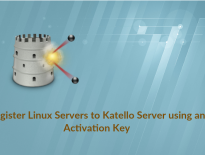 Here, in this post, we will configure Katello for providing packages and updates to its clients (we will discuss how to configure clients, later.). In brief, we will tell Katello to download repositories from upstream (Ex. mirror.centos.org) server and then create activation for registering client servers. Before downloading the repositories, create an organization in which you will be doing all the activities. Foreman Dashboard –> Default Organization –> Manage Organizations –> New Organization. Name your organization and then click on submit. By default, Foreman host (Where Katello installed) is assigned to “no organization“. If you wish to assign the Foreman host to ITzGeek organization; you can do it via “Assign All” or “Manually Assign” option. Here, I will choose to skip by clicking on “Proceed to Edit“. Simply click submit on the final page. Make sure you are in ITzGeek organization whenever you do any activities. Now, you would need to create a GPG keys to verify the integrity of the upstream repository. For Ex, to create a GPG key for CentOS 7 repository; go to the following URL and copy the content of the file. On Foreman, Content –> GPG Keys –> New GPG Key. Enter the name for the GPG Key and then paste the copied content; and finally, click Save. Let’s create a sync plan for repositories so that they can be synced with upstream servers on a specified interval. Go to Content –> Sync Plans –> New Sync Plan. Create a product for CentOS 7 with the following information. Go to Content –> Products –> New Product. Create a repository for CentOS 7 base OS by going to Content –> Products –> CentOS 7 (Click on Name) –> Repositories Tab –> Create Repository. After entering all the details, click Save. Initiate syncing of the OS_x86_64 repository by going to Content –> Products –> CentOS 7 (Click on Name) –> Repositories Tab –> Select Repository (OS_x86_64) –> Sync Now. Katello will start the syncing of the OS_x86_64 repository. To check the status of Sync, go to Content –> Sync Status. You would need to wait for this to complete. It may take few minutes or an hour long, depending on your internet speed. Once you have added the remaining repositories, your product page will look like below. As soon as you created it, start the Synchronization for new packages. From Content –> Products –> CentOS 7 (Click on Name) –> Repositories Tab. You can check the sync status of your newly created repositories, go to Content –> Sync Status.